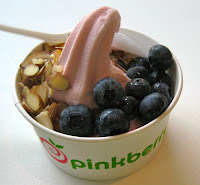 Just went to Pinkberry today to get my fix of their new passionfruit yogurt. Unfortunately their passionfruit machine was broken so I got pomegranate. On the plus side I was delightedly surprised that the flavors which usually cost $1.00 more are now the same price as original - for the month of July. Although I think it might end up getting extended. Cross your fingers! A small with toppings still runs you $4.82 including tax. But that's better than $5.82 right?